Rambo is one of the classic action hero characters. It is suprising that he has only appeared in four movies since his first appearance in 1982 (the fifth currently in production in 2018). What is most surprising is that most people when you think of Rambo, you immediately picture the soldier with the red bandana shooting a massive machine gun and taking out a hundred people. Now, while this is true of the sequels (especially the second one) it is not so of the original which most people may not even realise is called not Rambo, but First Blood. John Rambo is a Vietnam war vet who wanders into the wrong town. Here he is arrested by the local Sheriff and subjected to unnecessary cruelty which causes him to have flashbacks to being tortured in the war. This sets off a trigger in Rambo which results in him escaping and starting a war against the Police who are now fighting to stay alive to capture one man. Upon the arrival of his Commander they discover the truth about his time in the war and that Rambo is not just a man, he's a one man army capable of taking them all out. This leads to a cat and mouse chase to see who will survive. I loved this movie. Going in, I had all the misconceptions which I spoke of and I was pleasantly surprised at how much more of a drama than an action film this one was. I had seen the sequels many times before, but had never gotten round to watching the original. The film is a perfect mix of action and drama with some really emotional moments and the ending was so unexpected. I would never compare the sequels to a film like The Deer Hunter, but this film can be and really does explore the idea of the PSTD and how soldiers are treated when they are no longer at war. Stallone's performance here is on par with his original Rocky performance and it is a shame that it did not get him the same kind of critical acclaim. The film is wonderfully paced, the action sequences are pitched perfectly and the score by Jerry Goldsmith fits so well that again it is surprising that more critical acclaim was not heaped onto this movie like Rocky was. The disk is filled with extras which are great and I was surprised by how much I enjoyed them. The two Commentaries one by Sylvester Stallone and one by the writer of the original novel David Morrell are both great. I do wish they would have combined them or had someone with each to discuss this film. Both are full of stories about how the film was made, though I did think Morrell focused far too much on differences between the film and the book, but that was to be expected. There is an Alternative Ending which would have had a lot more impact, but would have killed the franchise dead, literally and a Deleted Scene showing Rambo in Saigon. This is an interesting scene to show him outside of the hell, torture and war that is depicted throughout most of the flashbacks. However, I understand why it was deleted. Two featurettes are included, the first part of a documentary Rambo takes the '80s which is a great documentary, but I do wish it was all together as one long documentary about how the Rambo character made such an impact on the decade. Drawing First Blood is a nice little making of looking at most aspects of the creation of the film. 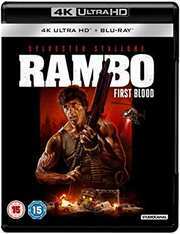 First Blood is a film that anyone who enjoys war movies like Full Metal Jacket, Platoon or The Deer Hunter should watch. It would be wrong to tarnish this particular film with the 'all out action' which became what the series became known for. Instead this is a more thoughtful movie and one that if you go in expecting typical Rambo action you will be pleasantly surprised.